What is Power of Attorney Form? A power of attorney form is used in legal matters when someone wants to give permission to an entity or a person to act on his behalf. The person who is chosen to give the attorney needs not to be the lawyer but they define their power to make several decisions. The person who grants the power of attorney is called principal while the person who is being given the attorney is called the agent. The power that is usually granted to the agent includes finance, real estate, family and also the authority over several issues related to the life of the person. It is also known as PoA forms. The power of attorney form is used to form a legal relationship between the principal and the agent. The power can be granted in a limited form or it can be broad. Most powerful and useful power of attorneys is usually those in which you give the complete power to the agent. The agent is given the permission to do anything that you could do in your presence is the broad form of power of attorney. There are different types of power of attorney such as a general power of attorney, special power of attorney etc. if you give a defined set of responsibilities to the agent, it means your power of attorney is limited. 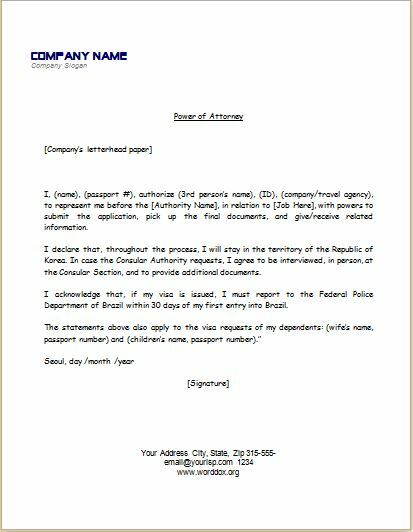 A durable power of attorney form: This type of form specifies that the power of your agent will remain in effect if you become incompetent. Springing power of attorney form or conditional power of attorney form, such type of form specifies that the agent has some permission only in particular situations. Such type of power of attorney gives the attorney to the agent in your absence or when you get an unexpected illness. When You May Need a PoA Form? When you want to permit someone to take important decisions regarding financial and medical affairs or handling them when you feel that you are mentally incapacitated. The power of attorney form is a special type of legal document which is required to be used with great care. It is advised the person granting permission to give the power of attorney to only that person whom he trusts. There are some free of cost templates that are very easy to use and save a lot of time of the user. These samples are guided documents to prepare a one for your requirement. Note: This topic is for educational purpose only. The author is not liable for any legal or professional use of the samples attached.